When the barbaric hordes of Slavic tribes invaded the Balkans in the 6th and 7th centuries they wrought havoc, chaos and destruction upon the region, which had previously been completely civilized and built by the Romans. Many important and flourishing cities, some of which had been part of Roman civilization for nearly a millennium, were raided, sacked and destroyed by the Slavs and their Avar allies. Ever since that period the Balkans has remained largely politically and economically backwards and underdeveloped, and has never again reached the same level of prosperity or prestige. The following are some of the notable cities destroyed by the Slavs. The city of Cassandreia, located on the Halkidiki peninsula in modern Greece, was founded in 316 BC by Cassander, the Hellenistic King of Macedon. The city became one of the most important cities of ancient Macedonia. In 43 BC the city became a Roman colony, known as Colonia Iulia Augusta Cassandrensis, and was colonized by Italic war veterans. The city was granted the status of Ius Italicum, meaning the community was legally regarded as being a part of Italy – the highest status and privilege a colony could receive. The city prospered until the 6th century AD, when it was completely destroyed by the Avars and the Slavs. To this day the ancient site of the city has been neglected and ignored by archaeologists. The city of Epidaurum, located in the extreme south of Dalmatia, began as a Greek colony in the 6th century BC. Since 228 BC, however, it had been a Roman city. It later became a Roman colony – one of the first in ancient Dalmatia – and was settled by Italic war veterans under Emperor Augustus. It remained a Roman-Italic city until the 7th century AD, when it was destroyed by the Avars and the Slavs. The surviving Roman inhabitants of the city fled to the nearby island of Lausa, where they took refuge and founded the city of Ragusa (today called “Dubrovnik”), which later became an Italian city-state and maritime republic in the same manner as Venice. Narona was an ancient Roman city located in the Narenta Valley of Dalmatia (in modern Croatia). It became a major Roman stronghold in the 1st century BC, and later became a Roman colony settled by war veterans from Italy. The city flourished for centuries, but ceased to exist in the 7th century AD when the Avars and the Slavs invaded and completely destroyed the city. The city later gave its name to a horde of Slavic pirates known as the Narentani, who settled in the ravaged region and terrorized Italian ships in the Adriatic and raided Italian coastal cities for the next several centuries. This city, located in the former Roman province of Thrace (in modern Bulgaria), was founded in the early 2nd century AD by Emperor Trajan. The city was destroyed by the Slavs in the 6th or 7th century AD. It still lies in ruins to this day. Risinium, located in modern Montenegro, originated as a fortress of Illyrian pirates in the 3rd century BC. Soon after it became a Roman fortress and Italic colony and was transformed into a great city, included in the Roman province of Illyricum and later Dalmatia. The city was destroyed by the Avars and the Slavs in the 6th century and the surviving local population was forced to abandon the city. By the 10th century Risinium had already been rebuilt in a nearby location and was known as Rosonum (later called Risano, today called “Risan”), but the ancient city remains in ruins. Salona originated as a Greek emporium (trading station) during the first millennium BC. 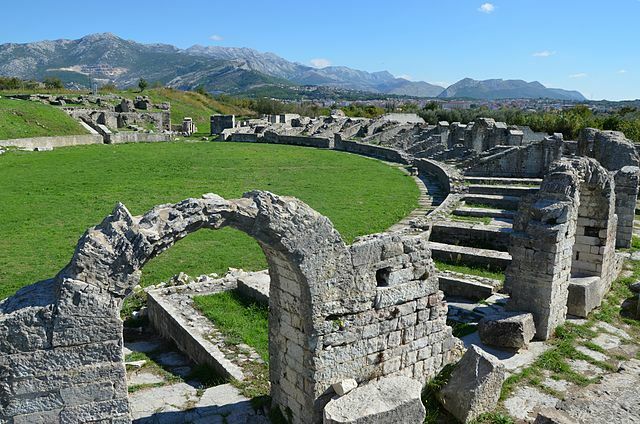 In the 1st century BC the Romans transformed Salona into a proper city. It became a Roman colony known as Colonia Martia Iulia Salona and was colonized by Italic war veterans. The Romans built, expanded and fortified the city, and it became the capital of Roman Dalmatia. It remained a Roman-Italic city until the 7th century AD, when it was destroyed by the Avars and the Slavs. The surviving Roman inhabitants of the city fled to the nearby Palace of Diocletian, where they took refuge and founded the city of Spalato. Scardona, located in Dalmatia, was founded by the Romans in approximately the 1st century BC. It was the capital of Liburnia, one of the three conventus iuridici which comprised Roman Dalmatia. The city was completely destroyed by the Slavs in the 7th century and the Roman inhabitants were dispersed. The city laid in ruins for three centuries before finally being rebuilt. The origins of Stoni are uncertain. It is believed that there was an early settlement either on or near the location of Stobi sometime between 800 BC - 480 BC during the period of the Paeonian Kingdom. However, Stobi first enters recorded history as a Roman city in 197 BC. It was a Roman colony, colonized by Italic war veterans, and was granted the status of Ius Italicum. It became the capital city of the Roman province of Macedonia Salutaris. It remained a very important Roman city for over 700 years until it was invaded by the Avars and the Slavs in the 6th century. The city had previously been sacked by the Goths in the 5th century but was successfully rebuilt. However, the invading Avars and the Slavs completely destroyed the economy and infrastructure of the city, from which it never recovered. The city remains in ruins today. Viminacium was founded by the Romans in the first century AD in what is now modern Serbia. It began as a military camp but soon grew into a major Roman city, one of the largest of its time, and became the provincial capital of Moesia Superior. In the 3rd century AD it was transformed into a Roman colony and settled by Italic war veterans. The city was ravaged by the Huns in the 5th century, but was restored by Emperor Justinian. The city was completely destroyed by the Avars and the Slavs in the 6th and 7th centuries.